This looks good, don't you agree? 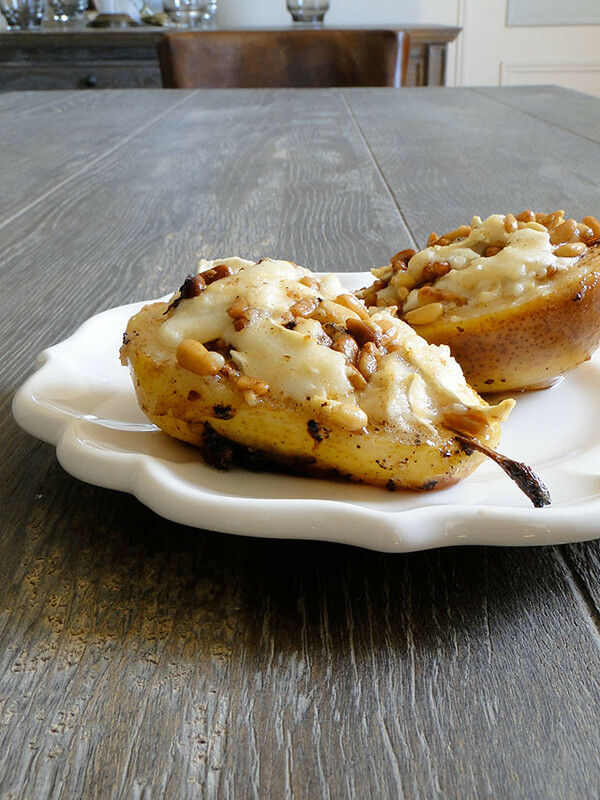 Well, let me tell you something, these roasted pears taste absolutely amazing!! As long as you like fruit and cheese combo, you will hit the jackpot with this recipe. Well, we are basking in beautiful weather. Spring has finally arrived, bringing us the sunshine and the wonders of nature with it! I look forward to the time when apple and cherry trees start to bloom because we know that spring has finally arrived. Though pears are basically a fall time food, this dish is all about being fresh and light to welcome the spring season. Well, I think this dish could work really in any season! 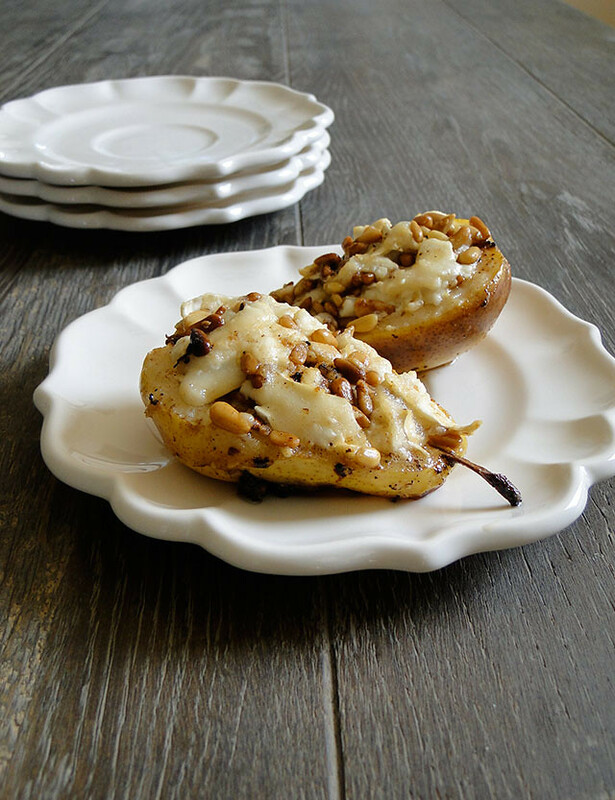 I loved this dish, because I love pears and I am fond of goat cheese! 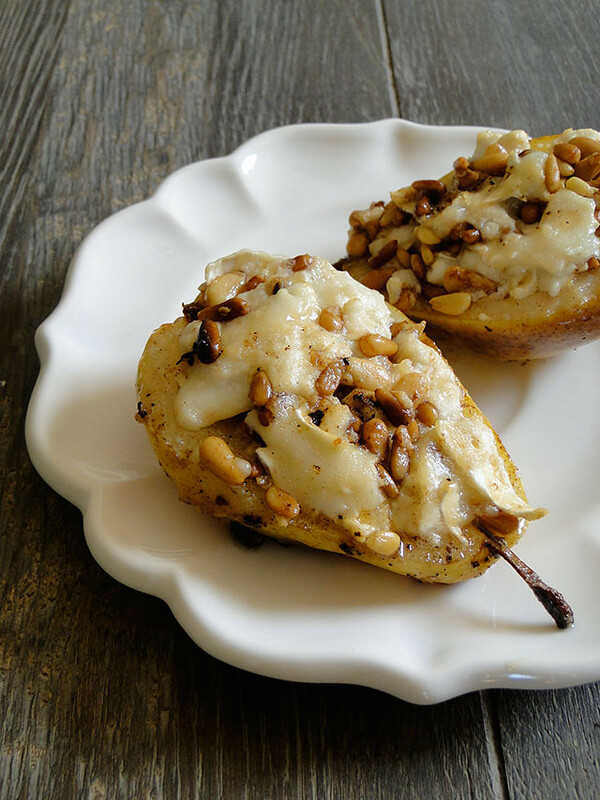 The sweetness of the pears contrasted the pungent goat cheese well, and the crunchiness of the toasted pine nuts complemented the soft texture of the pears. A recipe I will be making again and again! Wash the pears, slice them lengthwise into halves. With a small sharp paring knife and a spoon remove the core and seeds from each pear, leaving a round well for the filling. Heat the butter in a skillet and brown the pears, skin side down, on low heat for about 10 mn. Preheat your oven at 350ºF (180ºC). Place the pears in a ovenproof dish and pour the cooking butter on top. Add half a cup of water in the ovenproof dish. Bake 10 to 15 mn. Meanwhile, gently toss the goat cheese with the pine nuts and the rosemary in a small bowl. Season. Remove the pears from the oven. Divide the mixture among the pears, mounding it on top of the indentation. Spoon a bit of honey and bake them again for another 10 mn. Serve immediately. Lavez les poires et les coupez en deux en retirant les pépins. Creusez-les légèrement. Faites-les dorer ensuite côté chair dans une poêle avec le beurre sur feu doux pendant 10 min. Déposez les poires dans un plat allant au four, et arrosez-les avec le reste de beurre de cuisson, plus un 1/2 verre d’eau dans le fond du plat. Enfournez les poires 10 à 15 min. Entre temps, mélangez à la fourchette, le fromage de chèvre, les pignons et les brindilles de romarin hachées. Assaisonnez. Sortez les poires du four et garnissez-les du mélange de fromage de chèvre. Arrosez de miel et remettez au four 10 min. Servez aussitôt. A beautiful dish! That combination is perfect. I'm drooling! Goodness, these look divine. What have I never thought of combiining pears with goat cheese. Sounds like a winner! They look wonderful, Cherine, and delicious at any time of year! I do love pears with cheese. This looks fantastic! Wonderful flavours! It's pear season here in Australia so this sounds absolutely perfect! This looks enchantedly delicious!!! I am mesmerized. Gorgeous! I love the photography - the table is perfect for those pears. Goodness, those look delicious. What a creative flavor combo! Oh du sucré-salé ! une recette qui me plaît beaucoup ! They look marvelous! 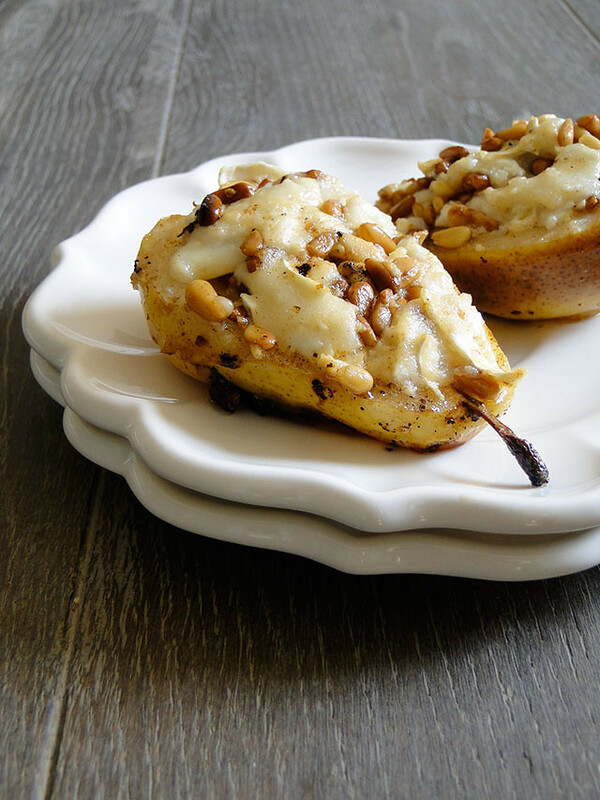 Perfect combo of pear and goat cheese. Sorry I haven't visited in a while! but then I pop in, and quality work is always there...Those pears are just a dream!! Beautiful, Cherine. 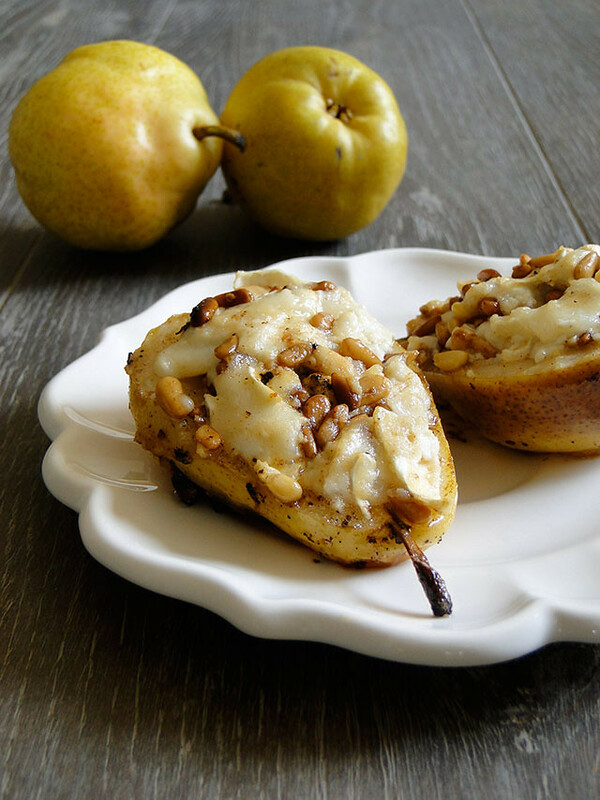 Pears are one of my favorite fruits and I love that you paired it with pine nuts and goat cheese. I love sweet and savory combinations especially involving cheese and fruit. These look delicious and decadent. great idea! it's a must try! These were awesome! I put them atop field greens for a delicious first course for sister's birthday. And last week I tried a variation on this by dicing the pears, sauteing them in butter and rosemary with pine nuts. The put the mixture on home made crostini, piped on the goat cheese and sprinkled with a few chopped chives. YUM! Got many raves. just wanted to thank you for this amazing recipe that went down a treat tonite! first time i ever made anything that looked like the picture! Magnifique, ca je tente absolument !